I have been reading the comments of the ignorant masses regarding Israel's boarding of a flotilla in international waters and thought I would look into some of the confusion that seems to plague the right-wing blogosphere. The so-called "liberal" argument is that Israel violated the law by boarding the ship in international waters. Essentially, the argument from the right goes something like this: "Israel is good. Blockade is good. Remember the Cuban Missile Crisis?" I was wondering what exactly this responder meant regarding the "short limit from the shore of a country" so I did a little search and came up with this little neo-con blog that basically supports what commenter was saying, citing pretty much everything but actual accepted international law. Obviously the commenter thought I was some sort of liberal troll and didn't think I understood international law regarding blockades - granted the only background I have in international treaties and such was a course I took in international environmental law. It doesn't take much to do some research on the matter, especially since this is a topic that is of interest to me. According to the neo-neocon, there are these three reasons that justify Israel: the "historic British psotion," the Declaration of London 1910, which neo-neocon incorrectly uses to justify the Cuban missile crisis, and opinion that the boat was headed to fund Hamas, a "belligerent, terrorist organization." It seems that everything was cited but there was an absence of mention of The United Nations Convention on The Law Of The Sea that was convened on December 10th, 1982 - something that would address the recent actions of Israel in a modern day context. Flame, from Big Government, responded for my request for some elaboration. I think to myself: "Why is it every example used to justify Israel is some historic document, not any recent international treaty or law?" I thought Flame's response was rather interesting because it was more details then the typical insult I would get from Big Government readers, and I was happy that Flame included a link for me to read an article that discussed both sides of the issues. Did I find the only Big Government commenter that was open to outside opinions? Reading the article was very interesting, because the author, Kevin Jon Heller, explained in detail things like the Sam Remo Manual rule, and it seems that Flame wasn't looking at the bigger picture - he simply chose what to believe (the first paragraph). The article states that the Sam Remo rule is the reason Israel gave for their raid. I know that will sound like a provocative question, but it’s not meant to be. 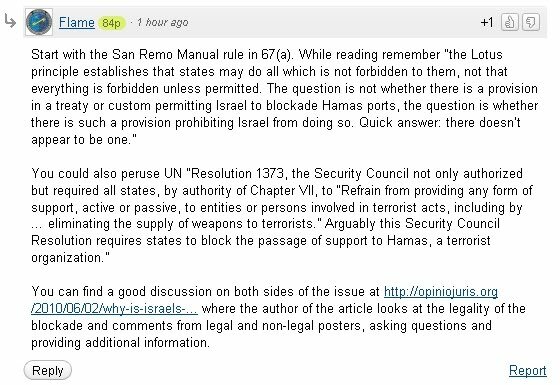 According to the Jerusalem Post, Israel justifies its interdiction of the “Freedom Flotilla” by reference to Article 67(a) of the San Remo Manual on International Law Applicable to Armed Conflict at Sea, which permits the attack of neutral merchant vessels that “are believed on reasonable grounds to be carrying contraband or breaching a blockade, and after prior warning they intentionally and clearly refuse to stop, or intentionally and clearly resist visit, search or capture.” The interdiction thus depends on the legality of the blockade of Gaza — and I am genuinely confused as to why that blockade is legal. The Jerusalem Post says the Israeli government is arguing that “Israel was in a state of armed conflict with Gaza and therefore entitled by international law to blockade Gaza.” But that defense ignores a critical question: what kind of armed conflict? If the conflict between Israel and Hamas is an international armed conflict (IAC), there is no question that Israel has the right to blockade Gaza. 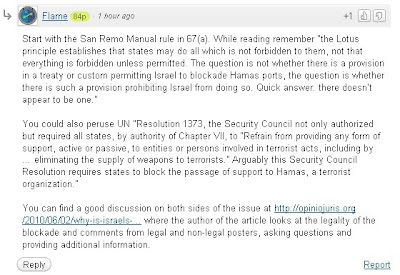 (Which is not to say that the manner in which Israel is blockading Gaza is legal. That’s a different question.) The 1909 Declaration Concerning the Laws of Naval War (the London Declaration), the first international instrument to acknowledge the legality of blockades, specifically recognized the right of belligerents to blockade their enemy during time of war. Article 97 of the San Remo Manual does likewise. And there is certainly no shortage of state practice supporting the legitimacy of blockades during IAC (the US blockade of Cuba, for example). There also appears to be little, if any, state practice to support the idea that a blockade is legally permissible in NIAC. According to the Jerusalem Post, the Israeli government is defending the blockade by citing Yoram Dinstein’s statement that “there are several instances of contemporary (post-UN Charter of the Law of the Seas) practices of blockades, e.g. in the Vietnam and in the Gulf War.” But those were all blockades in IAC. I can’t think of any blockades in NIAC other than Israel’s blockade of Gaza — though readers should feel free, of course, to correct me. The seeming absence of support for blockades in NIAC is obviously important, because it is difficult to argue that Israel is involved in an IAC with Hamas. First, it is obviously not in a traditional IAC, because Gaza is not a state. Second, not even Israel claims that the conflict has been internationalized by the involvement of another state. And third, although the Israeli Supreme Court held — controversially — in the Targeted Killings case that armed conflict between an occupying power and a rebel group is international, Israel’s official position is that it not currently occupying Gaza. The icing on the cake is that Heller does not believe the blockade to be legal, writing that "it is difficult to argue Israel has the legal right to blockade Gaza," which is funny because it seems that Flame's pulled his information in support of Israel from this article. Did Flame bother reading this or did he assume I was some troll? Also, did he think his fellow commenters would read the article? Probably not. Flame also focuses on U.N. Resolution 1373, which focuses on terrorism, not aid ships. I suppose one can view aid as "passive" support to entities in support of terrorist acts, but to deny aid would imply that the entire population is one that supports terrorism. Considering Israel had come under fire for their actions, receiving condemnation from many nations, as well as facing a posible United Nations probe into their actions, and the fact that Israel is now releasing the aid they captured, as well as considering easing the blockade, I would have to say that progress is being made. "The flotilla crisis is the latest symptom of a failed policy," Robert Serry, told the Security Council in an open briefing. "The closure and blockade of the Gaza Strip needs to come to an end." "It is much more important to turn our attention to what really needs to be done and needs to happen now, which is an effective end of what has been called the closure policy or the blockade of Gaza," said Serry. The envoy noted in his briefing that there was now a welcome international consensus on Gaza. He said it was fully agreed by the diplomatic Quartet comprising the UN, European Union, Russia and the United States that there must be a fundamental change to the situation.